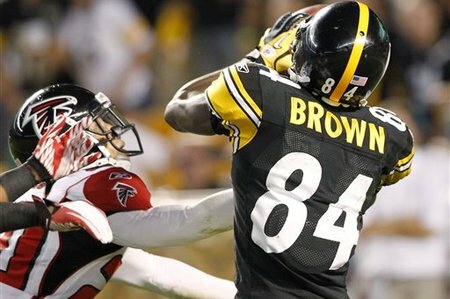 If we want to talk about true open field speed in the NFL, then take a look at this weekend’s Falcons-Steelers game to check out Antonio Brown. The Steelers WR took a deep dig route, turned up field and ran past this Atlanta defense for a 77-yard score. Brown finished the game with four catches for 136 yards and two touchdowns. The sophomore wide-receiver proved he can connect with Big Ben, he’s got great hands, and he’s fast. Number 3 WR, Emmanuel Sanders, is recovering from three different foot surgeries and may lose his spot to Brown if we continue to see this breakout performance. If he’s still available in your league, grab him ASAP!